My sister, Aby, called me two weeks ago to say that when she and her daughter, Kailea came into town from Illinois there were a few things they wanted to do: 1) catch a fish; 2) see a giraffe; and 3) go to a beach on Lake Michigan. It had been averaging 90 degrees in Michigan and I told Aby that people call this “the dog days of summer”, not “the largemouth bass days of summer”, so not to hold her breath. And I reminded her that amongst my pets were two ferrets, a cat, two dogs, 11 hamsters and some fish, and that to my knowledge, Mark had yet to order us up a giraffe. 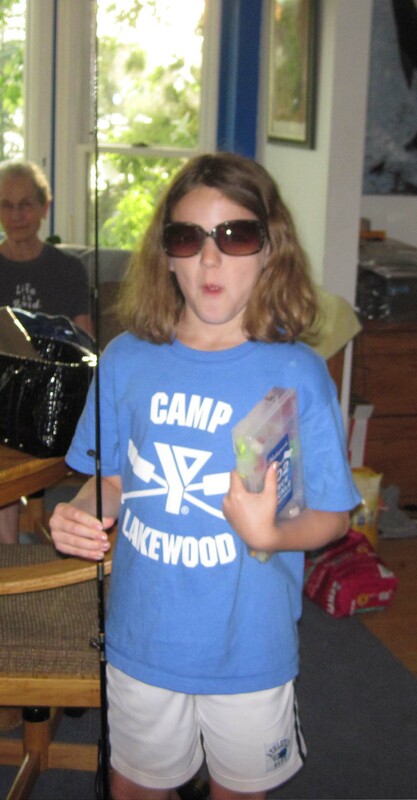 When Aby and Kailea arrived on the evening of July 20 to go fishing on my chemically correct lake, the temperature was still around 90 degrees. Mark had purchased a new rod and reel and a couple of rubber worms just for Kailea, so Aby, Kailea and I went out with the new gear to sweat in a boat and try our luck at fishing. 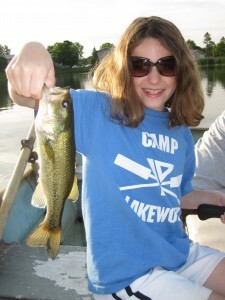 Kailea with a rod, reel and tackle. Using a rubber worm on her new rod and reel, Kailea caught her first largemouth bass. Woohoo! Soon after Kailea got a bass, I got a bass that Kailea reeled in. Then I got a pumpkinseed and she reeled that in. Then the sun set and Aby and Kailea went to my mom’s for the night. The next day, my mom, Aby, Kailea and I set out on our giraffe hunt. 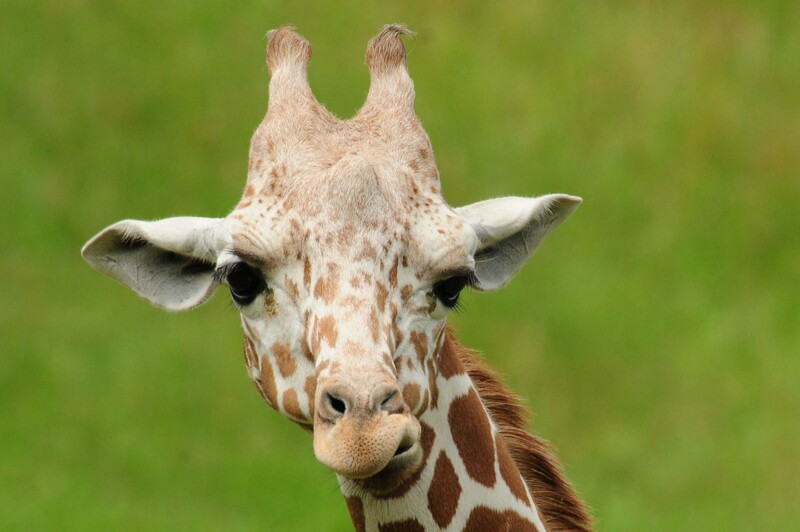 I had started the giraffe hunt the week before at our local zoo, the Potter Park Zoo, and, upon learning they had no giraffe, got online and looked for giraffes at other zoos. 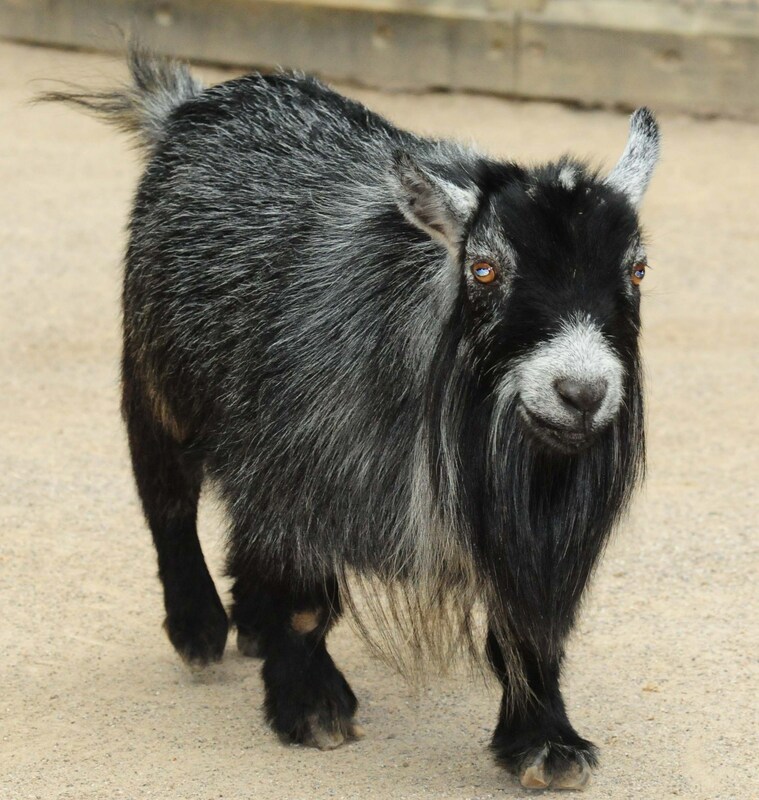 I stumbled upon the Binder Park Zoo in Battle Creek and was happy to see that they use giraffes as part of their web site graffics–I mean graphics. 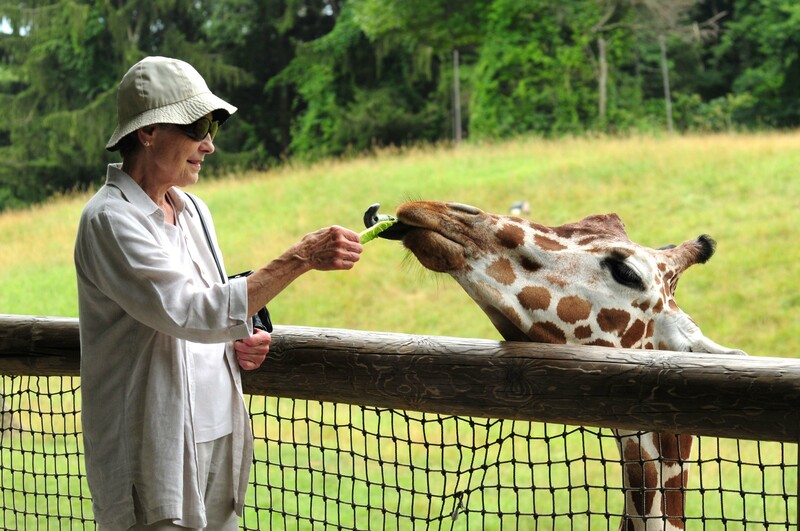 I crossed my fingers that we’d actually see a giraffe at the zoo. Now, most people aren’t dumb enough to go on giraffe hunts when it’s 93 degrees, which is why it was quite pleasant during our visit last week–there was nobody around. We went to the children’s zoo first, which was a pretty unimpressive collection of domestic critters hanging around in pens on pea gravel. The first critters we saw were goats. 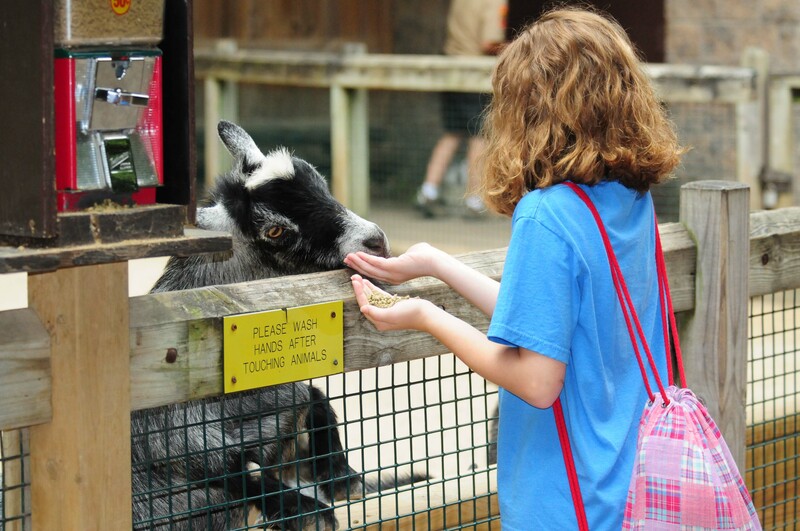 They were friendly goats and Kailea got to feed them. 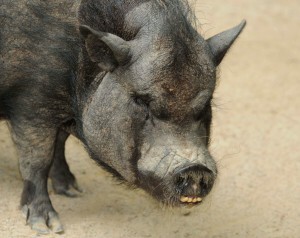 Nearby, was a really attractive fella I had to photograph. We did not try to feed him. After checking out a few other domestic animals, we attended a 15-minute presentation that featured some of the other zoo critters. 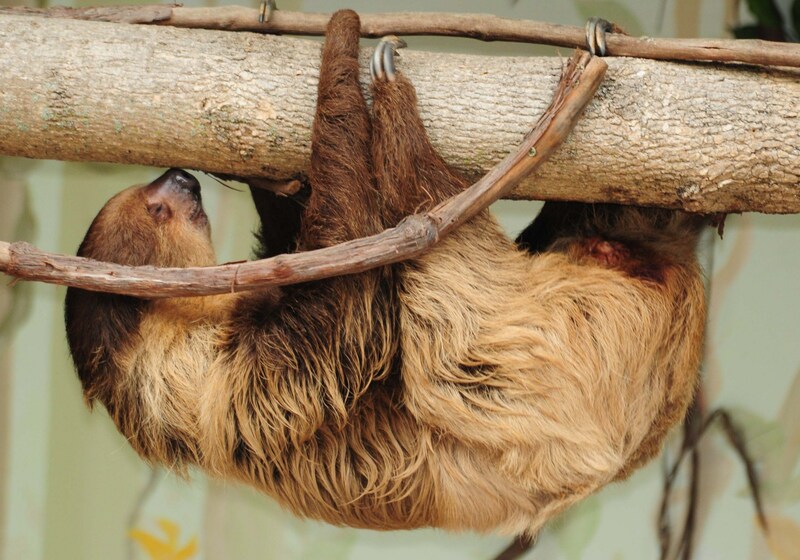 This two-toed sloth was one of our favorites. Two-toed sloth that, with his eyes closed, looks like he's sleep walking. We also saw this hawk. 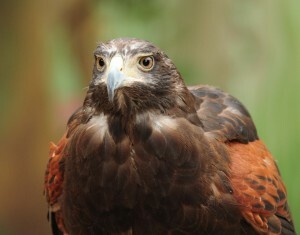 Hawk at Binder Park Zoo. The show also featured some rats, snakes and a parrot, and after saying hello to each of them, we continued our giraffe hunt by entering the part of Binder Park Zoo called Wild Africa. 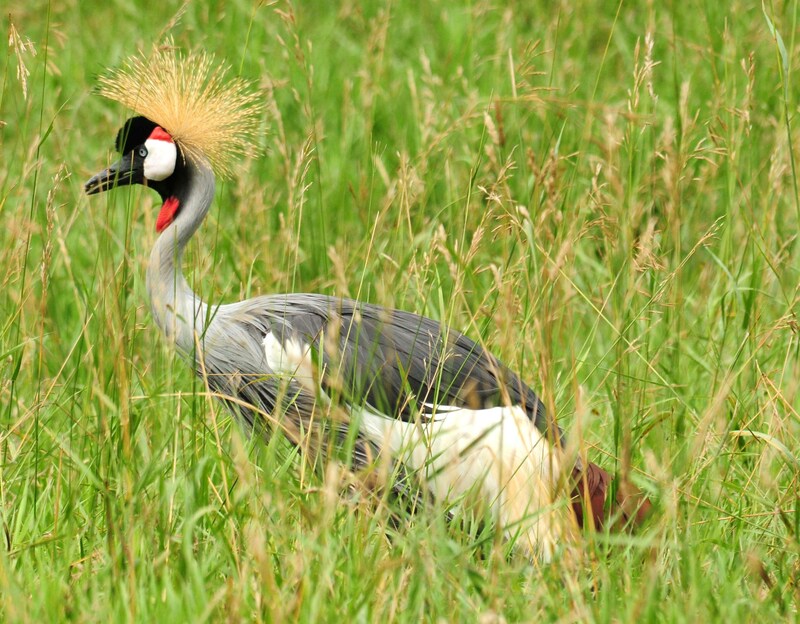 Wild Africa is a 20 minute walk or a short tram ride through the woods to a giant enclosure made just for African critters, including several birds and several brown fuzzy, furry critters that look like gazelles. African bird in Wild Africa. We also saw these guys. 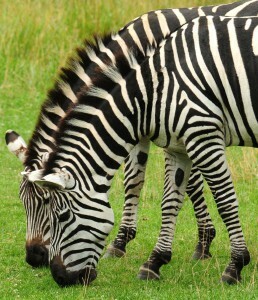 Two zebras in Wild Africa, Binder Zoo Park. 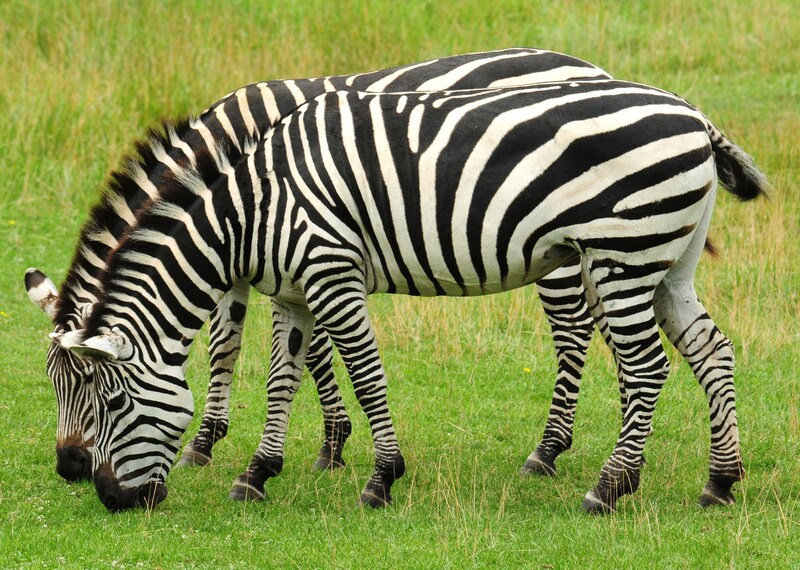 What I liked about these two zebras is how perfectly their stripes matched when they ate side by side. 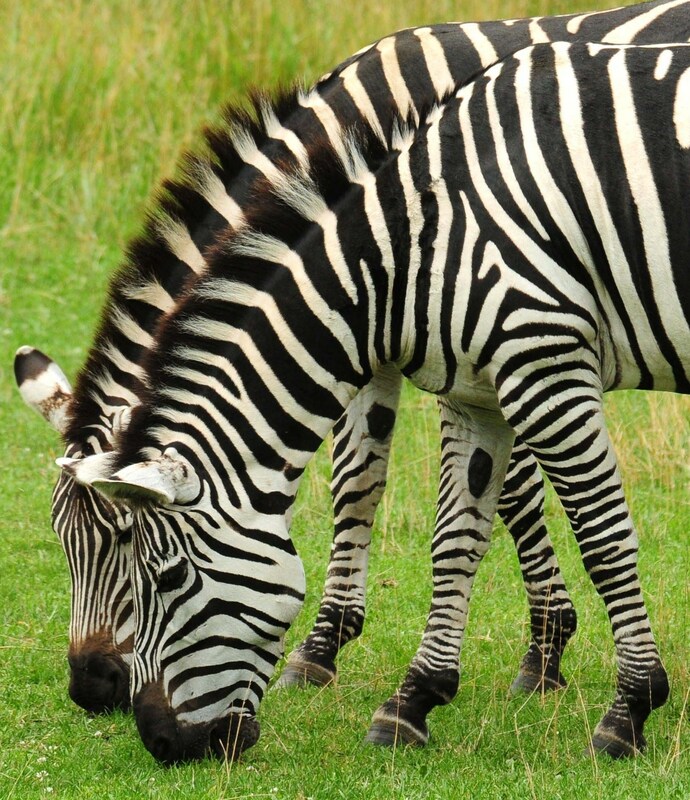 Synchronous stripe-ism, or some such thing. 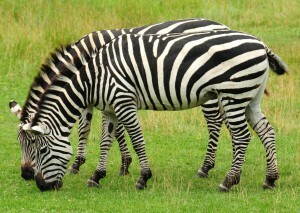 As we were taking photos of the zebras and birds, far, far away we saw two giraffes running in the open. They soon disappeared out of view off to our right somewhere, so we followed a path and discovered a large overlook where several giraffes were hanging around. Their heads were at our eye level, and nearby was a lady sitting in a booth selling lettuce to feed to the giraffes. You might imagine that I asked the lady for her job and that she would not give it to me. But for $1 a piece, I could buy all the lettuce I wanted. Kailea fed the giraffes. As did Mom. I was about to feed a giraffe when I came face to face with this tough character chewing his or her cud. Giraffe wondering where the lettuce is. 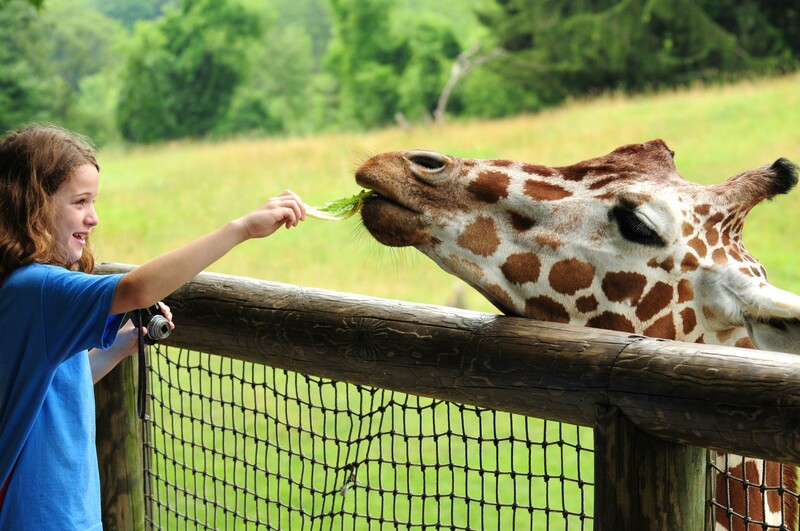 We were all so thrilled that we could all feed giraffes that we left soon after. In fact, I was so happy to have helped Kailea get a fish and see a giraffe that I sent her and Aby off to Grand Rapids to spend time with my father. It turns out my father is Aby’s father, too, so it wasn’t like a punishment or anything. Last Friday, July 22, my dad turned 75 and we celebrated by going to the beach. 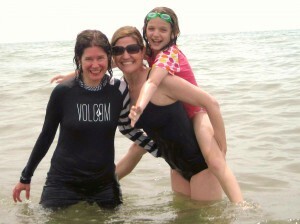 Me, Aby and Kailea in Lake Michigan. 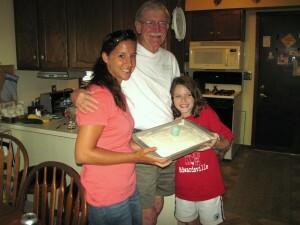 Holly came along, too, and after we beached, she and Kailea made Dad a birthday cake. Holly, Dad and Kailea with Dad's birthday cake. So all in all, I think Aby and Kailea’s visit was a success. In fact, remember that we spent about two hours fishing and caught three fish on our lake? Well, after Aby and Kailea returned to Illinois, Mark, his nephew, Terry, and I spent one day on Thornapple Lake, two days on Lake St. Clair and one day on Lake Hudson and had only a half dozen fish to talk about. And we didn’t see a single giraffe.